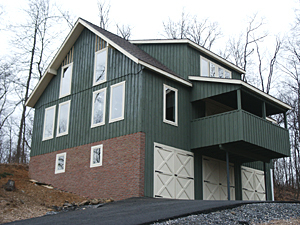 Construction of a Bank Barn is a great option for areas with steep slopes or where flat land is simply not available. Keep in mind that bank barns are more costly to build, but they do provide an extra story and ground accessibility to both, lower & upper floors. As of now, our contractor builds bank barns locally only in Pennsylvania. 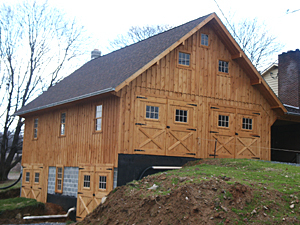 Bank barns are often built with traditional stud-frame construction and may easily be converted into a regular house. If you have a need for a bank barn, please contact us for more information, quotes, etc. Copyright © 2010 - 2019 Keystone Barn Supply LLC. All rights reserved.